Stem cells in the form of mesenchymal stromal cells derived from various sources have been identified to have the potential of supporting the therapy of joint disease in the horse, and preliminary data has been published about the clinical application of stem cells in horses suffering from clinical joint disease. Furthermore, the horse is recognized to be the ideal large animal model for the preclinical study of cell therapy in joints. The advantage of this species in this respect is the size of the joints, which makes surgical applications practically feasible in analogy to human surgery. Additionally, the horse is the only model species with a cartilage thickness in the knee joint comparable to that of humans. Especially the fact that horses develop clinical joint disease discerns this species from other large animal models like small ruminants. 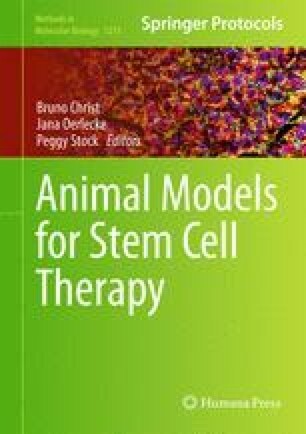 The therapy of clinical disease in model animal species represents the ideal situation for preclinical studies of novel therapeutic strategies. Here, we describe the experimental and clinical approaches to joint disease in the horse. The work presented in this paper was made possible by funding from the German Federal Ministry of Education and Research (BMBF 1315883).